We manufacture and export a wide range of Connecting Rods that meets the demands of engineering related industry. Available in various technical specifications, our range of connecting rods is appreciated for salient features like corrosion resistance, high tensile strength and dimensional accuracy across the globe. We offer Connecting Rod Repairing, to satisfy our clients’ requirements at competitive prices. We are teamed up with well trained Technicians to provide the best solution for Marine Engine Connecting Rod Repair. Connecting Rod Repairing includes removal of ovality using measures such as boring, grinding and other job as per requirement. Our firm is deeply immersed in offering best range of Used OEM Connecting Rod of optimal quality.These products are obtained from different sources and in safe condition. Professionals are able to offer onsite service all the time. Besides, we finish the work by taking minimal time and following best techniques. A Worldwide Services Around the Clock Connecting rod reconditioning is an important part of MPA Power Projects Pvt. Ltd. (India) Services. This stand alone service complements our core services of Diesel Engine repair and maintenance, and is increasing demand. Last Mile Consultants is working closely with educational institutions to bridge the ever widening gap between education and industry demands. 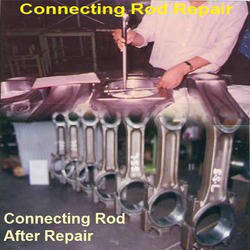 The company has developed technology to salvage expensive con rod housings by repairing them in-house. For correction of the damaged serration, ultra sonic testing to determine invisible cracks is carried out. Rectification of the dimensional wear in housing bores, straightness, parallelism, and centre distance checking etc. New Punjab Motor And Tractor Work. Con-rod boring machine is solid & vibration free structure, main advantage is speed & feed is variable, accurate tool setting in microns, and excellent boring finish.